Ask anyone to name one branch of business that is flourishing nowadays and I bet many answers will point to Fashion. What is called “fashion” has been a passion and an inspiration to many generations of humanity. Therefore, as the whole world is developing with a greater speed than ever, fashion has to pick up the pace, and one of its strategies is to have an online presence. 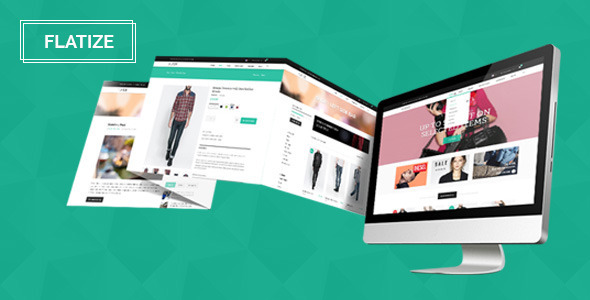 Since many fashion designers, fashion shops, fashion icons and also fashion bloggers have made efforts to sell their products online, the demand for fashion shop themes and templates are certainly rising. Understanding your real struggle to find a reasonable yet effective template to start a fashion shop, I decided to make a collection entitled “Top 8 Fashion Shop PSD Templates with Great Design”. As these 8 PSD templates below are all carefully handpicked, they are guaranteed to have amazing appearance with a whole lot of useful features. Choose to buy any of them, and you will not be let down. There is just one tiny problem: because I have tried to give you the best PSD templates I could find, they may share some features in common. 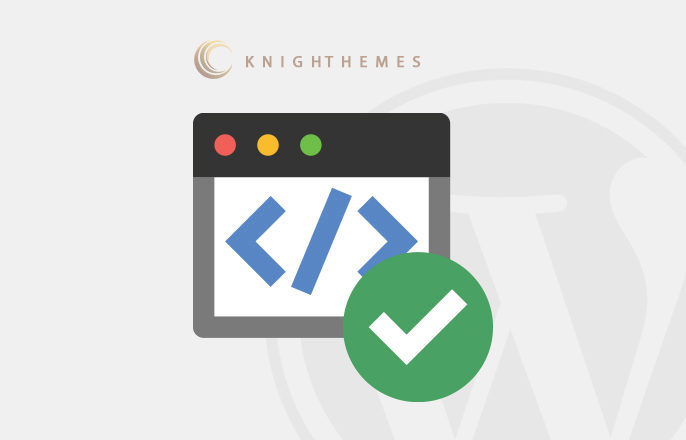 For example, they all contain numerous pre-made layouts, easy customization, pixel perfect, retina ready or the ability to be transformed into WordPress, Joomla and other CMSs, etc. Most importantly, they are all designed with great care and meticulousness. What does this lead to? Well, it leads to the fact that you will have to take all of these PSD templates into deep consideration in order to find out the best among the goodies. Worry not, however! Because they all come with Screenshots to make it easier for you to choose! Presented by Knighthemes, NEVEDA can be considered the ideal PSD eCommerce template anyone could dream of. Featuring beautiful saturated button colors to highlight the necessary contrast and flat UI with bright-colored backgrounds, NEVEDA is the most suitable PSD template to build a fashion shop of your own. You want to hear more? Well, NEVEDA has a firm and attractive color palettes with black and white mixed together in a combination, which is bound to make your online store a one of a kind. To name some of its main features, I have to say NEVEDA’s designers have a very good taste in arranging, as they did a very good job in arranging its 13 PSD files, including 03 fashionable home pages, well-structured layer groups and diverse sample page layouts such as About Us, Contact, Newsletter, Shopping cart. And like I said in the opening, this amazing PSD template can be changed into other versions matching with WordPress, Joomla, Drupal and many more. If you are still confused, let’s take a quick look at other excellent features: easy and customizable PSD files; fully and logically layered PSD; Google fonts used and font awesome icons; and Extended documentation. Still want more? Why don’t you come and visit its Screenshots? Given such an interesting name, this fashion PSD template from themevast will also make you feel interested once you know it. 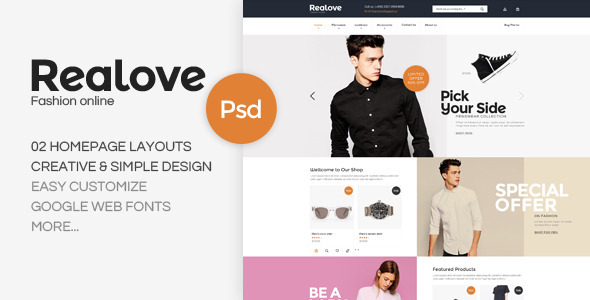 Its creators do not have so much to talk bout their child, apart from saying that Realove – Premium Fashion PSD Template is a unique eCommerce template designed with Photoshop with a so-called “simple, clean & clear” orientation in mind. What is more, its PSD files are well-arranged and given their file names in a way to make it very easy to customize and update. It has 02 homepage layouts, 02 category pages and many well-structured layers. Those are just some of their core features, others include 13 fully layered Adobe Photoshop .PSD files; well organized layers that make it smooth to update; site content being 1170px grid wide; Featured/Sale/New Products Tabs Slider, Daily Deal; Category Grid and List view and many more. 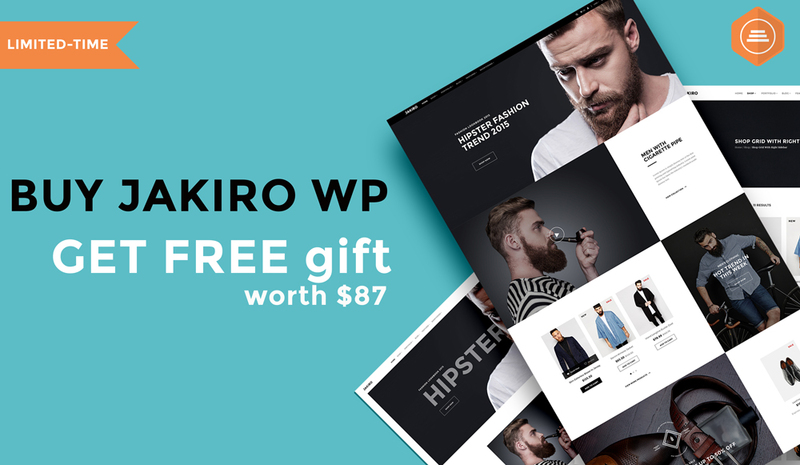 To find out whether this PSD template suits your intention for your future store, take a look at its Screenshots! 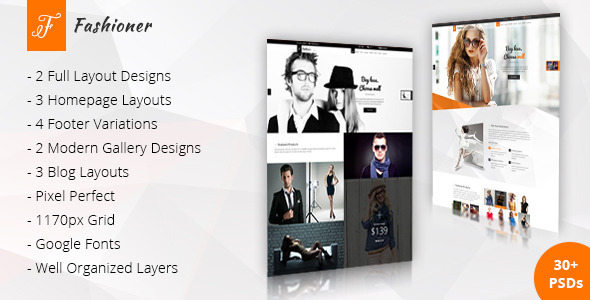 Begge is a production of ThemeSun, home to many renowned PSD templates on Theme Forest. 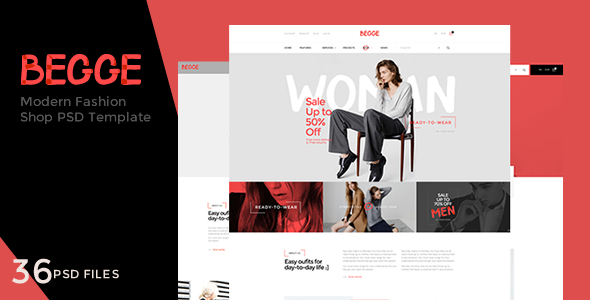 Introduced as a modern fashion shop PSD template designed based on the latest trend for your online shop, Begge is said to be well-organized, fully customizable and easy to use. But that’s not everything nice about Begge. Among other great features, Begge has 36 PSD files included, with 3+ awesome perfect pixel homepages, based on 1170px – 12 columns Grid system and possesses super clear and clean layouts. Moreover, Begge is also integrated with such features as awesome and creative design, which I love most about Begge; Featured/Sale/New Products Tabs Slider, Daily Deal; Pixel Perfect; fully layered and organized PSD files with proper names; a strange and unique interface, streamlined and impressive files; not to mention the free Google Fonts and the Retina Ready, together with Free Font Based Icons, and so on. Find your own reasons to love Begge like I do by visiting its Screenshots! Brought to life by Themographics, Fashioner Modern PSD Template seems to be one of the most remarkable PSD templates ever made by the team, as they have so much to say about this goodie. Said to be designed specifically for products that are required to meet the ever changing fashion trends, it has such a contemporary and eye catching appearance that makes it hard to take your eyes off it. Furthermore, its beautifully designed pages are sure to capture the heart of your visitors. Understanding that tastes are different from person to person, the team has put real efforts into catering for the largest number of people possible by presenting multiple versions. How about its features? 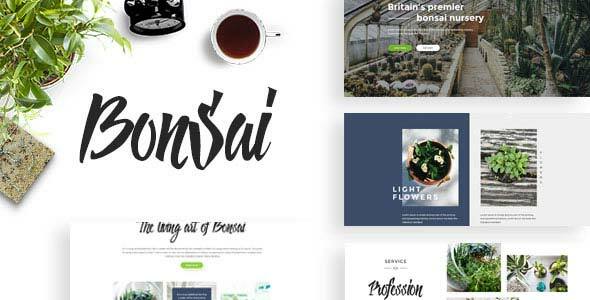 Well, there is a total of 31 PSD files, including 2 full layout designs, 3 homepage layouts, 2 modern gallery designs, 3 blog layouts and 4 variations of footers to suit your taste and also to ensure that one of the most vital parts of your website looks as marvelous as possible. Sounds cool, doesn’t it?! And it is indeed very cool! To feel it your way, please make a visit to see its Screenshots! The fact that this fashion store PSD template by azelab is rated with the complete 5/5 has already told us much about how terrific it is, hasn’t it? 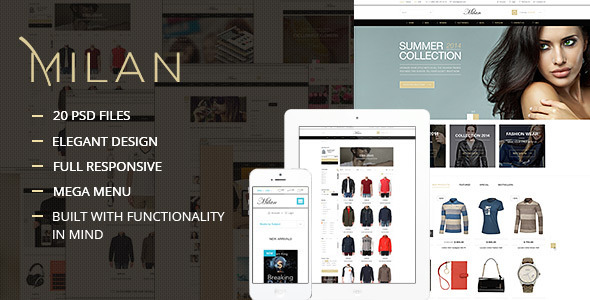 Milan is a fully responsive eCommerce PSD template designed with clean and modern style for the business of selling high fashion such as clothings, shoes, bags, accessories – fashion for men and women in general. It was launched to cater for all types, including Opencart, Magento, WooCommerce and Prestashop platforms. In addition, Milan is based on Bootstrap, which ensures its smooth operation and good-looking display. To list out some Milan’s key features, I’d go for its modern and clean layouts, 20 PSD files, Mega Menu available, its responsiveness and easy integrity with bootstrap; its easiness to customize and its well-organized characteristic. Regarding icons, it uses icons from Elegant Font, Simple Line Icons Webfont and Font Awesome. See its Screenshots, and you will be bedazzled for sure! KL-Webmedia has succeeded in bringing to us one of the most incredible fashion PSD templates in this series of fashion shop PSD templates with great design! 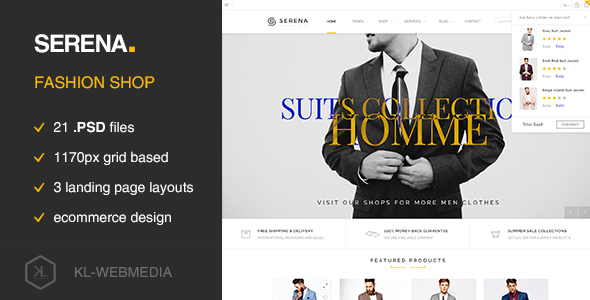 To be short, Serena is a PSD template designed for fashion shops and eCommerce websites. Claimed to be highly suitable for all types of eCcommerce, this template has a flat and purpose-oriented design, with a responsive layout and such impressive features as appointment forms, shopping carts, login forms, checkout pages, popup windows and other relevant elements, including blog layouts and landing pages. What I really love about this PSD template is that the team guarantees a life-long support for the product when it is purchased. It means that supposing any problem arises with the template, we can always rely on their help! To see for yourself how amazing it is, check out its Screenshots! What is so special about this PSD template from NooThemePSD that makes me include it in my list? Well, Fulgor is a clean, neat and modern PSD template for all kinds of eCommerce websites. 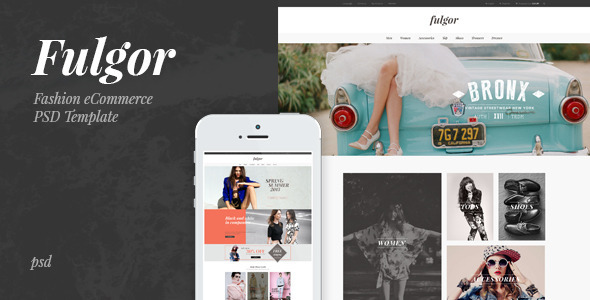 Emerging in simple yet classy and fashionable design, Fulgor has everything it takes to start an online store: Product Listing, Product Details, Shopping Cart, Lookbook, and Checkout pages also. Think it’s all Fulgor’s got? Nope! There is an additional number of layout options packed with Fulgor, which are 3 homepage variations, 4 product list and 02 category presentation. Just like its fellows above, Fulgor has such key features as Easily customizable PSD files with well-organized and properly-named layers; Pixel perfect; free Google fonts; Font Awesome icons, etc. Although there are many things else to say about Fulgor, I suggest seeing Fulgor with your own eyes via its Screenshots. 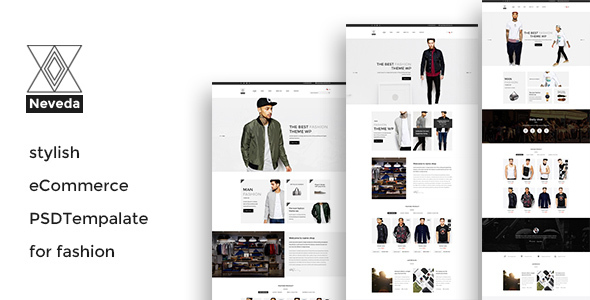 Flatize – Fashion eCommerce PSD Template by pixelgeeklab is depicted as a classy, luxurious, fresh and clear template which basically has everything required for online fashion stores. Easily satisfying all of your needs, Flatize is bound to deserve a spot in this series. What about its core features? Well, I’m about to bring that up too! Generally, Flatize has 25 PSD included, all are designed in flat, unique and modern styles. Vector shape; clarity and elegance; 08 color variations; well-organized layers; Google Web Fonts used; together with Font Awesome used are other features among the finest. Above is just a quick description of the PSD template, so why don’t you go to its Screenshots and find out more? So! How do you think about the collection I have just given you?! Not so bad, isn’t it? 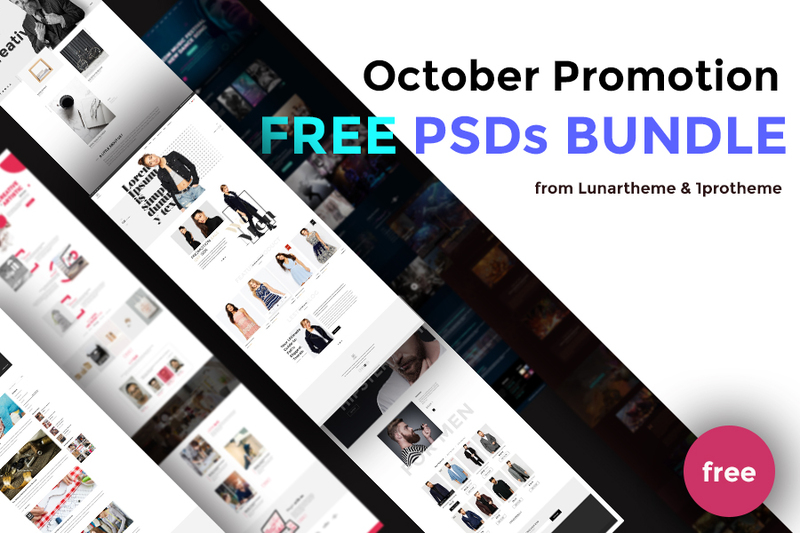 Considering everything ranging from the good appearance, the worthy features they offer and the reasonable prices, every single PSD template out of those 8 fashion shop PSD templates totally deserves your attention. Interested in building a fashion shop online and want to purchase one of them? It is totally up to your taste to choose a template that will work the magic, but my recommendation is NEVADA, one of the newest and most complicatedly designed PSD templates ever of Knighthemes. Why? Because you surely do not want to run into problems while installing and using the template, right?! With NEVADA, that is almost guaranteed. What is your choice after an in-depth consideration? Let us know in the comment section and have a chat about it! Currently a student at DAV, I'm studying English Linguistics at the same time with nurturing my passion for WordPress and Open CMS, love to curate WordPress Resources.